I was at school and I think I was either 8 or 9 years old when I first tasted this dish. There was a party and everyone including the teachers had to bring home cooked food. Like all kids, I love pasta but that silky, and smooth white sauce did something to me that day. The combination was amazing and the dish looked so different to me. When I was a kid, I was a picky eater (I picked every food I saw.) taking a bite from the macaroni with white sauce made me realize that cooking is an art. What was a shame is the fact that you couldn’t get this macaroni with white sauce anywhere in the market. Unfortunately, my mom didn’t know how to make it. So you can imagine my frustration. In the video you’ll notice the amount of ingredients is more than what’s in the recipe, I have doubled it since I had to send some to my sister’s place. This recipe is basic, so feel free to play around with it. Enjoy! Melt the butter, then add the flour and stir on medium heat. When bubbles appear, pour the cold milk all at once, and whisk. Season with salt and black pepper. Continue stirring to avoid lumps. When the mixture thickens turn off heat. Add oil to a pan, when hot add the onion and stir until almost brown. Add the beef and stir until the beef is cooked, which may take 15 minutes on medium heat. Season with salt and black pepper. Stir and turn off the heat. In a boiling water add salt and then the elbow macaroni, let it cook for 10 minutes then rinse, or follow instruction written on the packet. 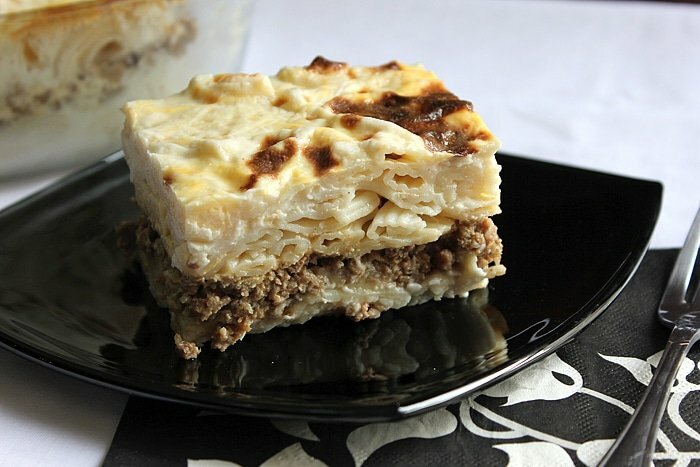 In a baking pan, add enough macaroni to cover the bottom. Pour around 3/4 cup white sauce on top and mix well. Add all the beef on top and press it down using the back of a stirring spoon. Add rest of macaroni spreading it evenly. Pour the rest of the white sauce, and spread evenly. In a separate bowl add the eggs, heavy cream, and season with salt and black pepper. Whisk well and pour all of it or half of the mixture on top of white sauce. Bake in a preheated oven 350F/180C for 20 minutes. Turn off oven and turn on the broiler to let the surface of the dish turn golden brown with few dark patches. It's best to serve immediately to enjoy the silky smooth texture of the white sauce. 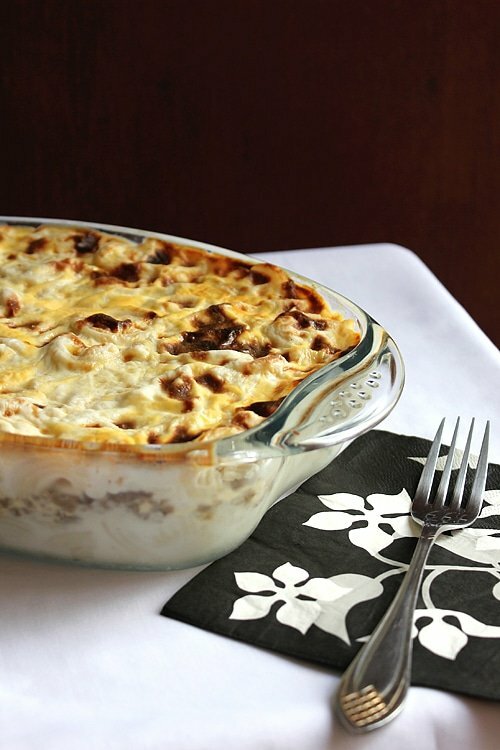 i am sucker for bachamel sauce and your dish is one my favorite baked comfort foods. I made it before and I know how delicious this is…now you made me very hungry that I will probably have to make it for lunch haha oh and awesome video! 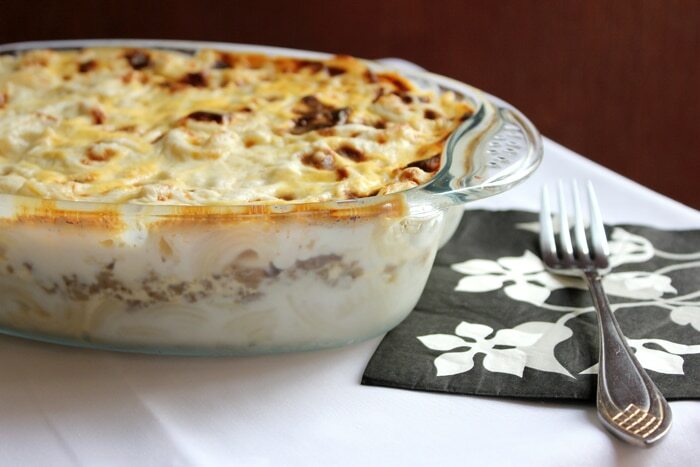 This delicious looking casserole is a great change from red sauce. It is so easy to put together! I am going to use your recipe but substitute chopped portabello mushrooms for the beef. My vegetarian daughter loves pasta and I think this would make great frozen lunches for work as well as a comfort food dinner! Thanks! A scrumptious casserole! It must taste wonderful. I love white sauce!! I make it from scratch too. I love watching your video clips and again you did a fantastic job. With good tempo music and watching delicious food, I think I’m ready to sit at the table waiting for this food!! 😉 Pinned!